Greetings everyone. I’m one of the newest DIS Unplugged Blog contributors, Disneyland correspondent and a part of the new DIS Unplugged Disneyland podcast. This is my first Blog and I’m still trying to find my style and figure all this out. So here we go. 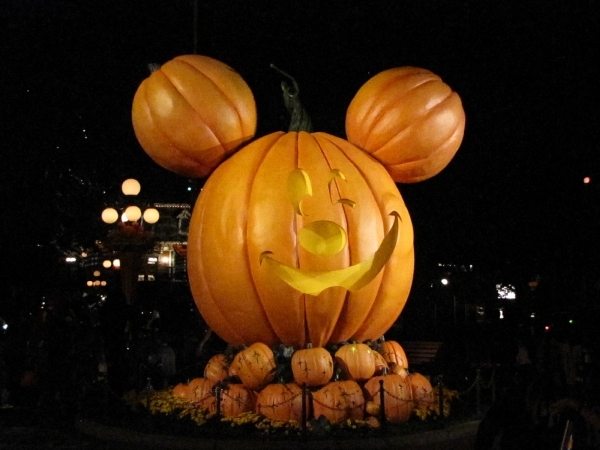 This year, the Disneyland Resort moved Mickey’s Halloween Party, its annual Halloween special event, to the Disneyland Park. 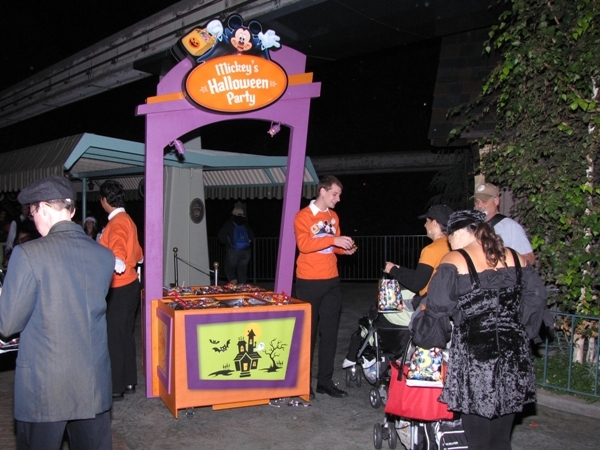 For the last several years, the very successful Mickey’s Trick or Treat Party was held at Disney California Adventure. The DISUnplugged Disneyland Team attended the Party in its new location. Follow me, as I take you through our experiences and share a few tips. I attended Mickey’s Halloween Party on a Friday evening. With me was fellow Disneyland correspondent Nancy Johnson, our Orlando podcast team member Teresa Echols and DISboards friend Kelly Willey. It was great having Teresa and Kelly join Nancy and me. This was Teresa’s second trip to Disneyland and her first to Halloween Time and the Party. 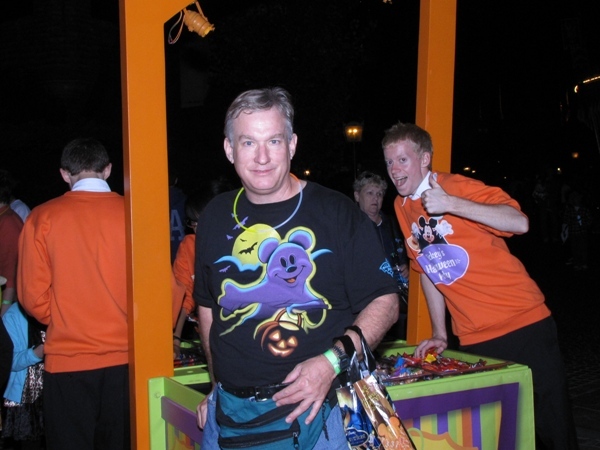 Fellow Disneyland correspondent Tony Spittell had attended Mickey’s Halloween Party on Tuesday that week. The party only occurs on Tuesdays and Fridays. Tony will also share some of his experiences with us. 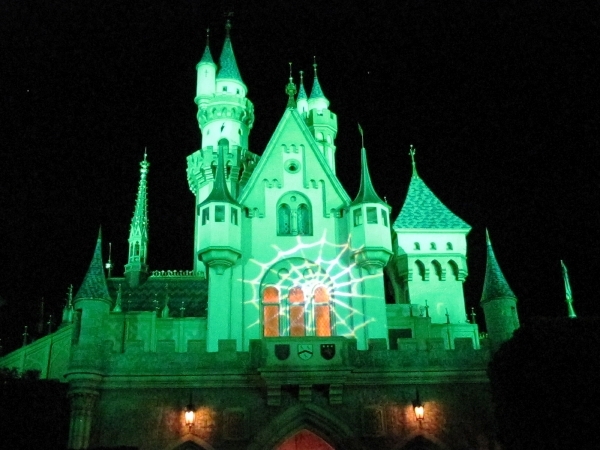 Much of Disneyland has been decorated for Halloween Time and it’s similar to the past several years (see Halloween Time 2009). 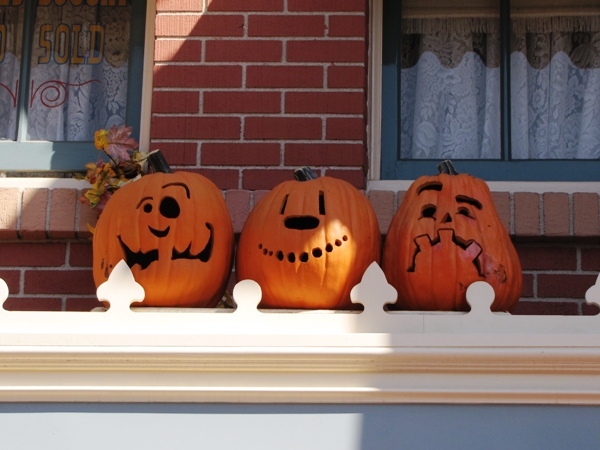 That includes all the character pumpkin heads above the turnstiles, the carved pumpkins along Main Street and the Big Thunder Ranch Halloween Roundup. Teresa and Nancy investigated the special party merchandise. Teresa found an attractive spider web headband that she wore all night. Nancy picked up a couple Pumpkin Mickey Head demitasse cups that were filled with pumpkin mousse and spice cake. I grabbed a Mickey-bat cookie. 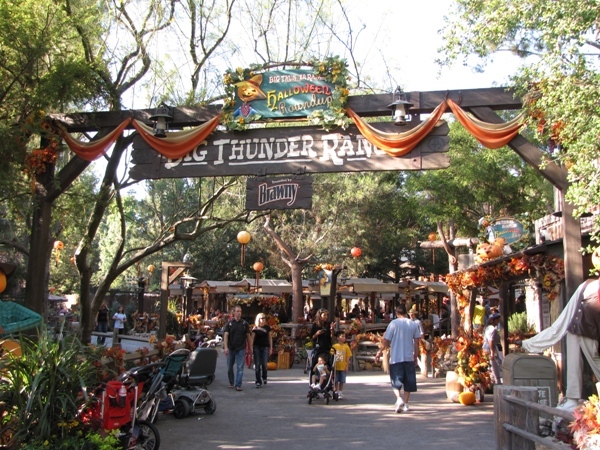 Tony noted that there are special Halloween Time treats at many locations around the park which are available throughout the season. Nancy’s TIP: We got a locker earlier in the day which we were able to keep through the start of the Halloween Party. That made it great to store pullovers and costumes for later, as well as souvenirs. Late in the afternoon, Disneyland began to transform. Special carts, stands and “blow-up” figures (not inflated yet) were brought out and set up all over the park. You can feel that something exciting is about to happen. 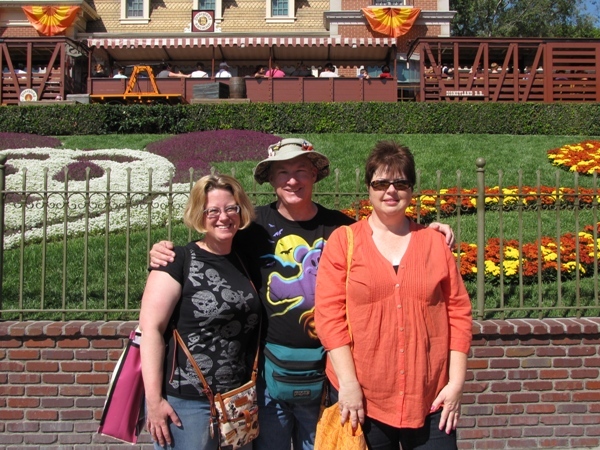 Teresa, Nancy and I had been inside Disneyland most of the day and we already had our event tickets. After about 4:00 pm, we were able to go to the Annual Pass Processing Center which had been transformed into a ticket exchange center. We got our Party wristbands very quickly and were able to avoid the lines outside the turnstiles. 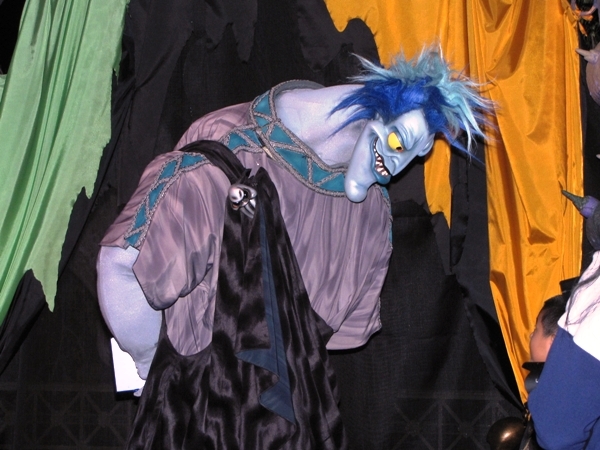 As the Party started (at 7:00 pm on Friday), the Cast Members began a slow and subtle “sweep” and began blocking admittance to areas of the park to all but Party guests with wristbands. I was really impressed by how well we were able to move through the checkpoints and how well the orange-shirted Cast Members and Disney Security were handling the changeover. Main Street was divided between inbound and outbound traffic and Tony noted that it became a habit to raise your wristbands when you passed Cast Members. We had to laugh at that, because we found ourselves doing the same thing! Nancy’s TIP: Check out the special park map that is given out for the party. 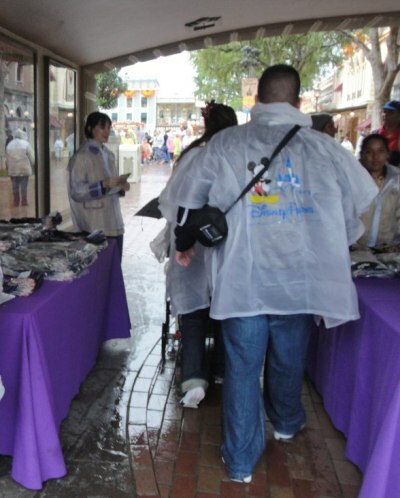 It shows locations for all special merchandise and food, as well as what attractions and dining locations are open. As the dusk settled into nighttime, you could hear the Disney’s traditional “Boo to you” Halloween music being played in the background. 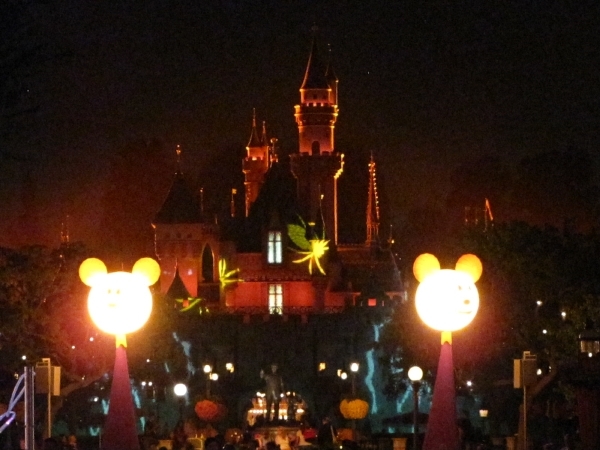 The special party lights were turned on and the newly inflated, glowing Mickey Jack-o-Lanterns surrounded the hub and castle. Each bore a different face and welcomed us to the different lands. 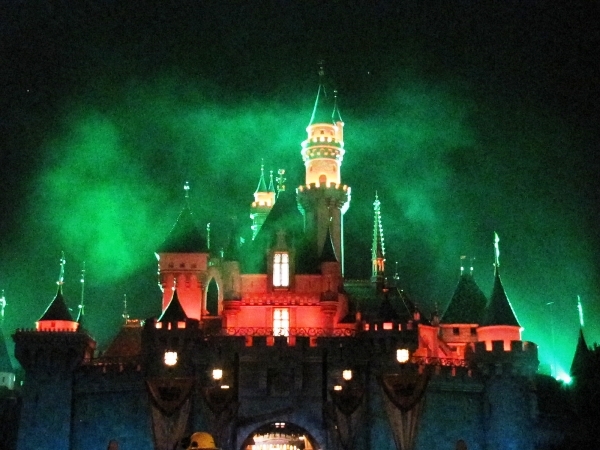 Sleeping Beauty Castle was appropriately lit up with changing Halloween colors and fog from the top of the turrets. Shadows of spiders and ghosts would occasionally crawl up the walls. Every place you looked there was something to see. At first I wondered how they would be able to fill an area as big as Disneyland with this event. But as we walked around every place was decorated. It was really wonderful. 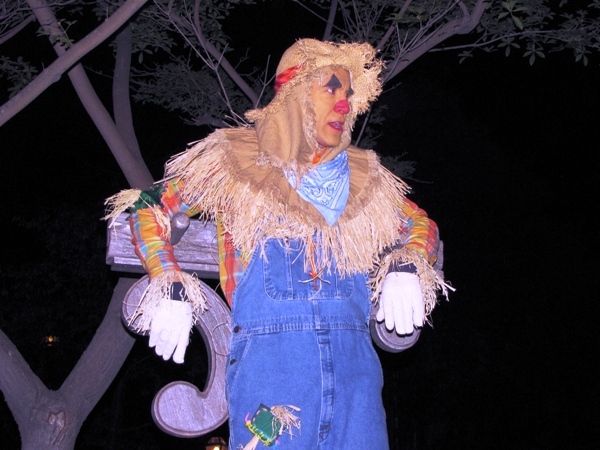 At the entrance to Frontierland, we were greeted by a charmingly sarcastic scarecrow. 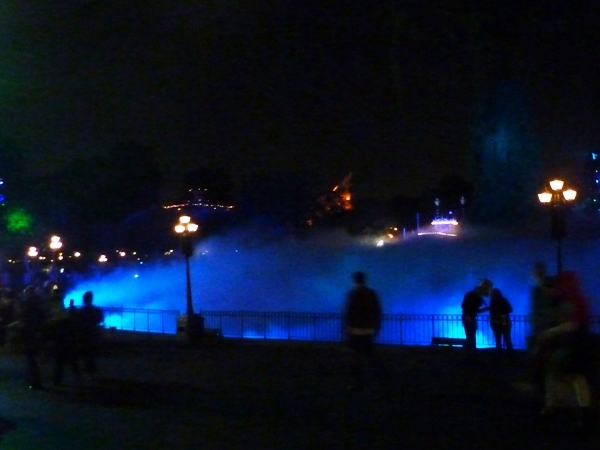 There was a mist of fog out over the Rivers of America. The atmosphere was great and in places it was actually kind of creepy. We decided to look at our special park maps to see where to go next. Of course, the Trick or Treat stations! Teresa commented that there were only 8 stations marked on the map. “Well that shouldn’t take long to cover,” she commented. 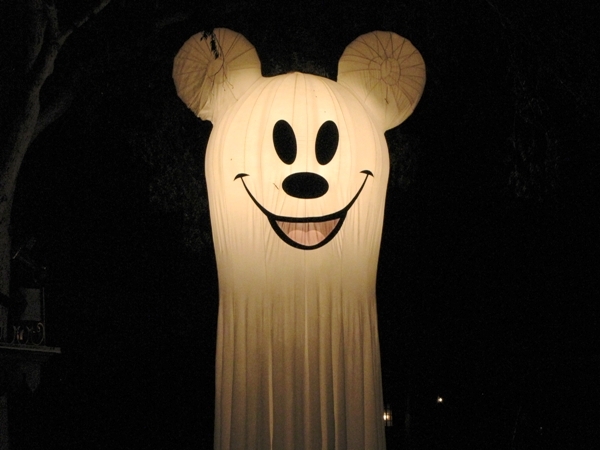 Each Trick or Treat area was marked by a large Mickey shaped ghost. When we approached the first one we realized that this was only the start of the trail. Each trail had several Trick or Treat carts. There were 50 carts in all of the trails! The cast members filled our bags and were very generous. 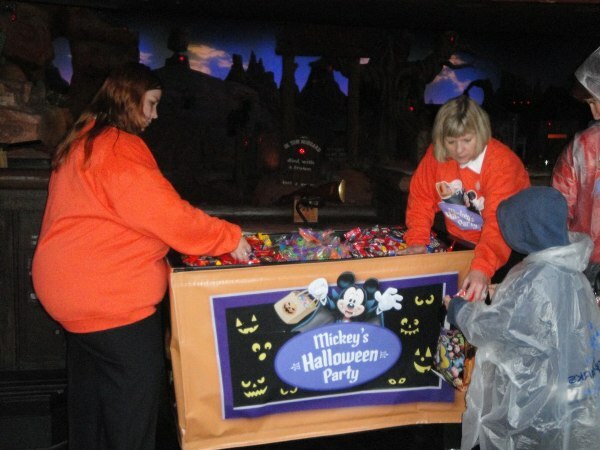 I noticed that the quality and brand names of the treats were even better than last year’s party (and from what I understand, better than last year’s Mickey’s Not So Scary Party at Disney World). It didn’t take long at all to fill our bags. After some comments on the DIS Unplugged podcast last year about how only kids seems to get handfuls of treats, Teresa came up with a clever scheme. 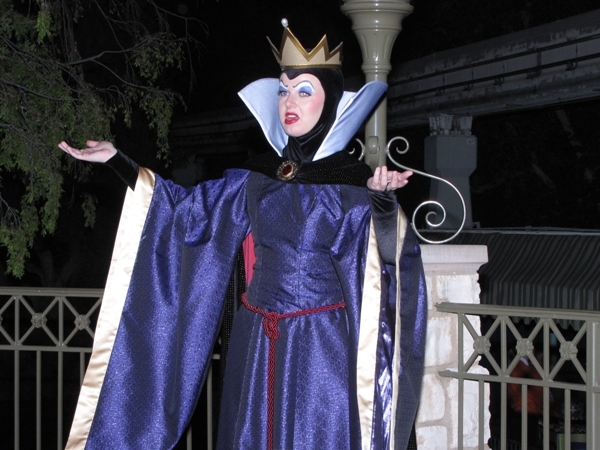 At each station she would tell the Disneyland Cast Member that she had just come from Walt Disney World’s Halloween Party and she wanted the CM to prove why Disneyland’s Party was better. It worked! Teresa got handfuls of treats each time. One CM gave her five handfuls. Of course it was great fun watching the kids and parents as everyone went from station to station. The lines moved quickly and everyone seemed to be having such a good time. There’s nothing better than watching kids surrounded by the magic. 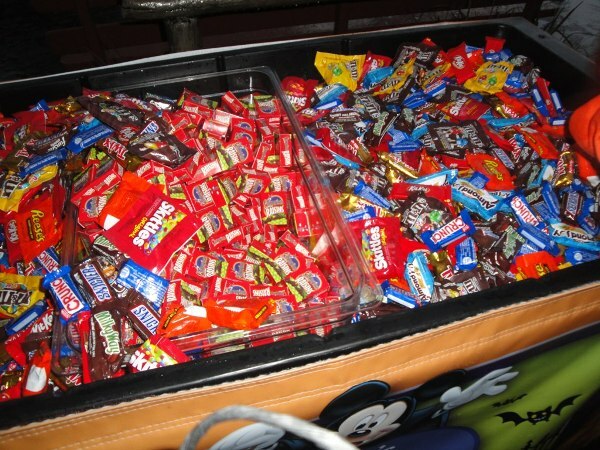 Nancy’s TIP: For the Trick or Treat Stations – bring your own bag, or else something you can store your treasure in. The ones provided are about the volume of a child’s lunch box. If you try to do all of the stations, you will definitely reach the point of overflowing. 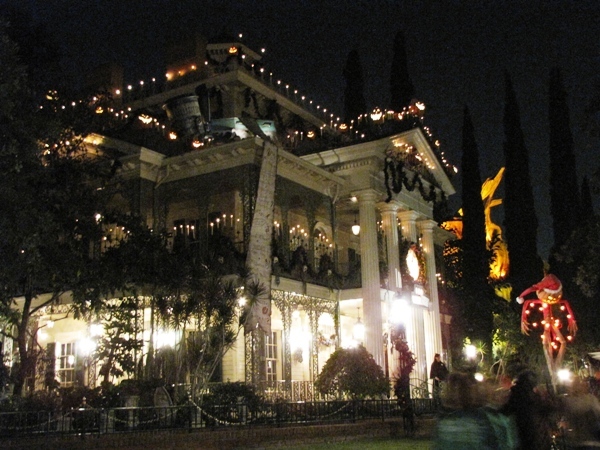 After that we went to one of my all time favorites, the Haunted Mansion Holiday. 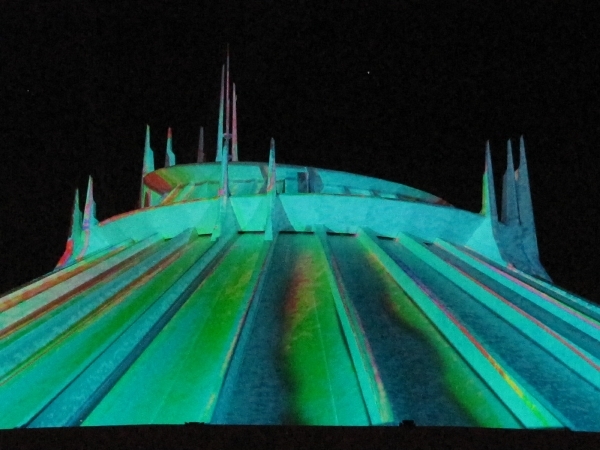 This really is a signature attraction; it is so much more that just an overlay. This is a completely new experience and definitely a “must see” for everyone visiting at this time of year. The haunting music box playing outside the Mansion sets the tone for what’s inside. The narration and all the added special effects make this an entirely new experience. Even if you are not a Nightmare Before Christmas fan, this attraction is exquisite. 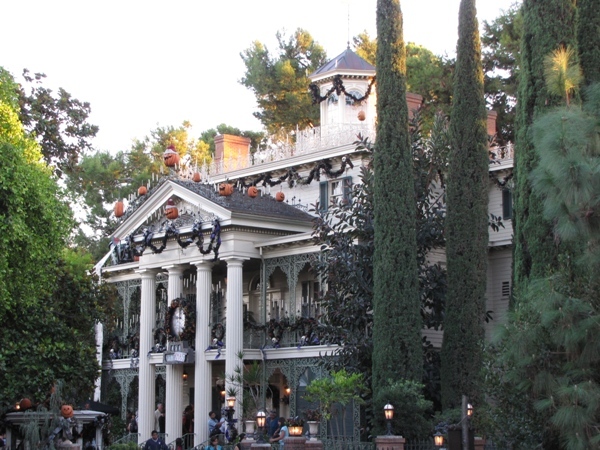 I cannot say enough good things about the Haunted Mansion Holiday. And don’t forget to look for the gingerbread house in the ballroom (which is a new design every year). Teresa especially liked the Haunted Mansion Holiday and couldn’t get enough of it. She rode it at least 10 times! The lines were an hour long during the daytime (if you can’t get a Fast Pass), but were much shorter for the Halloween Party (about 10 minutes). 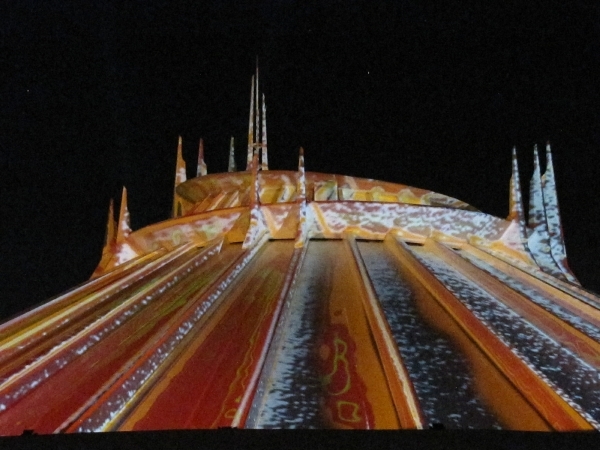 Tony also noted that, “The lines were incredibly short” for most of the popular attractions. Nancy’s TIP: The feature attractions are really the first place everyone thinks to go when the party starts. In the first hours of the party, those same attractions are also still clearing the long lines of non-party goers that were already in line when the party started at 7 pm. If you just wait a little while and enjoy some of the other special features of the party – such as the first run of the parade, you’ll be rewarded with much shorter lines. We continued to move around Disneyland looking for entertainment and activities. 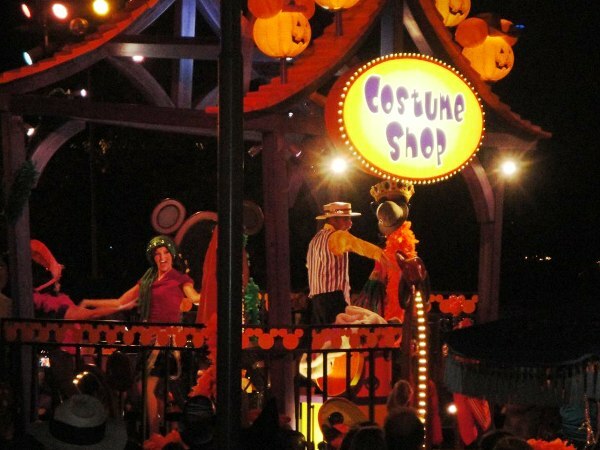 We caught a glimpse of Mickey’s Costume Party Cavalcade which is the special character parade for the Halloween Party. Nancy’s TIP: If you aren’t accompanied by smaller and/or sleepier children, wait for the second running of the parade at 10:30. Crowds are larger at the 9 pm parade for that very reason, If you are seeing the 9:00 parade, try to find a place to watch it at the hub, near the castle. That way, you are in place for fireworks viewing at 9:30. 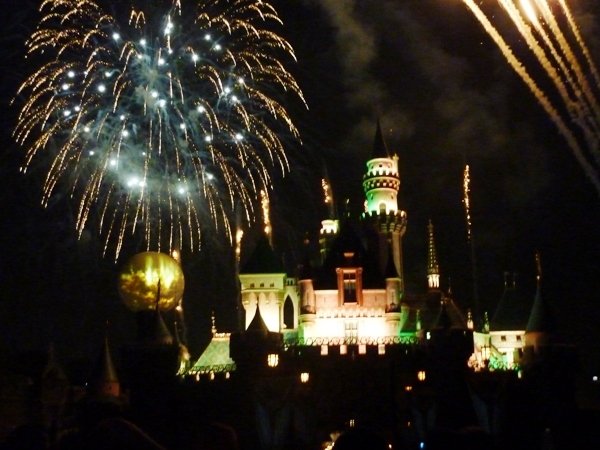 As the evening continued, I directed the group to my favorite place in front of the Castle to see the Halloween Screams fireworks show. 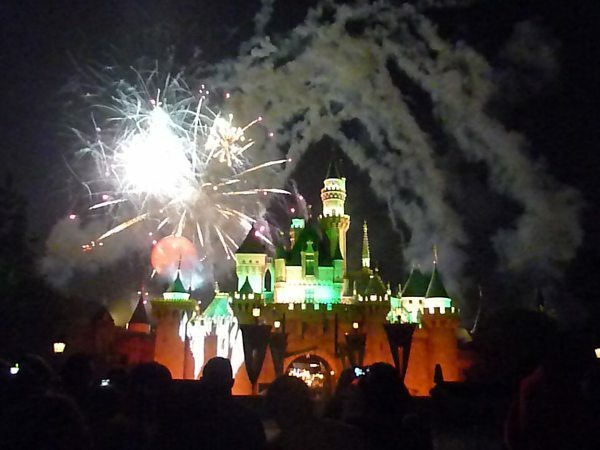 Disneyland has always had superb fireworks shows and Halloween Screams is at the top of the list. I’d love to tell you about every part of the show, but the surprises are half the fun of this show. Of course we have appearances by some of your favorite Disney Halloween characters, but also there are some special guests and ghosts and a flying pet that had everyone cheering. No Disney party would be complete without some special pictures with your favorite seasonal characters. This year, we saw some characters that haven’t been out for quite some time. 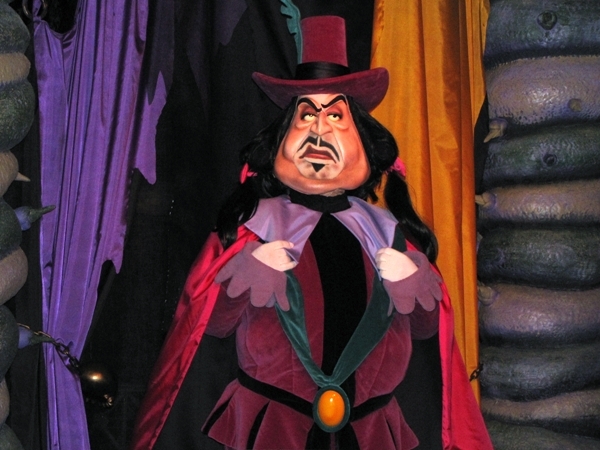 Disneyland has a special “Disney Villains” area set up for meet and greet pictures. Tony found Mickey and Minnie dressed in costumes at Big Thunder Ranch, Tigger in Critter Country and Jack and Sally at the French Market. The Columbia was docked and the queue area was turned into Pirate Wharf for Captain Hook, Peter Pan, Wendy and Captain Jack Sparrow. We noticed a lot of guests in costumes. We saw kids dressed in princess and pirate outfits, Star Wars and Buzz Lightyear costumes and even a nicely dressed set of Grim Grinning Ghosts. Nancy’s TIP: If you are dressed as a Disney character, you will not be allowed to have your photo taken with other guests posing with you. This is against the policies of admission to the party. 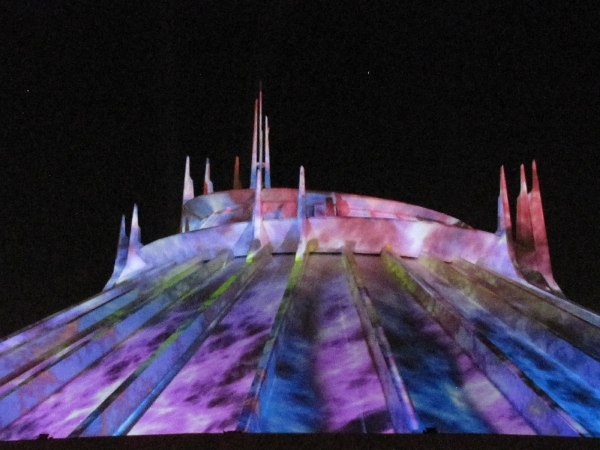 Over in Tomorrowland, Space Mountain has been transformed to the Ghost Galaxy attraction. The Space Mountain ride is enhanced with some special effects inside the mountain, but what was also fascinating was what was going on outside the Mountain. Special moving patterns were being projected onto the Mountain surface and are accompanied by a haunting and trance-like sound as the patterns change and swirl. Occasionally a special sequence would be projected which appeared to further distort the Mountain. It was hypnotic to watch. Nancy’s TIP: I wouldn’t take younger children on Ghost Galaxy, even if they have ridden it as its normal version, due to the nature of the ghoul effects. Your mileage may vary on your child’s ability to handle the attraction. Nancy’s TIP: To make it an even better value, I would recommend going online and purchasing your tickets in advance – don’t call to purchase tickets. You can print them out, saving you shipping charges from a phone order, as well as a few dollars at the ticket office. The Party was over all too quickly and honestly we barely had time to see everything, grab some food and ride a couple attractions. I don’t think we encountered one problem or difficult situation. Was the event worth coming to? Absolutely! 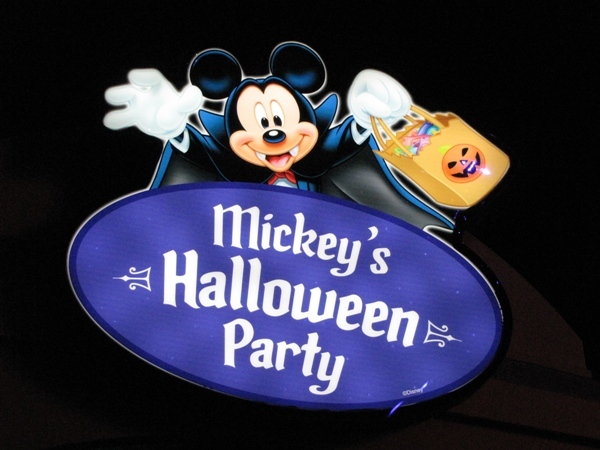 Mickey’s Halloween Party is a great success and I would recommend it for everyone. There is so much to do and see. This will be on my “must do” list every year. And maybe we can talk Teresa into coming back again. I’m even considering coming back for another evening this month. This is a winner! 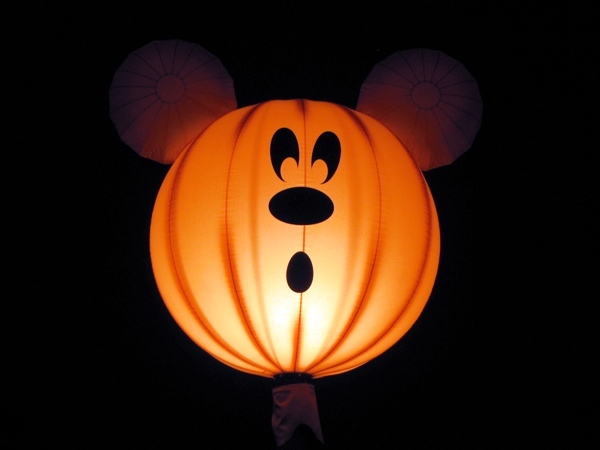 Mickey’s Halloween Party at Disneyland: A Night for Families!